Zipfit is an acronym for Zero Injection Pressure Fit (system), developed by Sven Coomer, one of the most recognized ski boot designers in the world. Sven lives with his wife Mary in Aspen, where he remains at the helm of Zipfit development and production, using a select and diversified team of professional and amateur testers around the world to help refine models. Sven was born in Sydney and competed for Australia in the Modern Pentathlon at the 1956 Melbourne Olympics. In the late 1950s, he taught himself how to cross country ski while studying industrial design in Stockholm. Over one spring break in Åre, he taught himself to downhill ski using the same boots and wood cross country skis! By late 1961 he was training with the French national team. Sven skied (just in training) with the French team again in 1964, introducing perspectives on training and athleticism that some racers found quite useful, including future gold medalist Jean-Claude Killy. Sven’s focus on the foot and lower leg performance was born from six years of international modern pentathlon training and competition, and it has defined his career ever since. He first applied this passion to build a pair of ski boots in 1962 at the Heierling boot factory in Davos, where he created a double-leather, double-lace boot. As a tester for SKIING magazine’s ski reviews in the late 1960s, Sven skied in the very first plastic boots and, most importantly, learned that the inner-boot is essential as a protective medium from unforgiving plastic shells as well as the “unseen powerful energy transmission system” for skiers. Sven’s work on footwear began as a consultant to Puma in 1965, helping what was then one of two leading athletic shoe manufacturers to develop specialized track and field shoes for Tartan rubber tracks and the new Astroturf fields. During that period, he was also teaching and coaching skiing. He began designing ski boots in 1969 for Nordica, a connection made through Beconta, the US importer for Nordica, Puma, Volkl, Look and other leading products of the day. Nordica liked Sven’s ideas and assigned him to the task of developing anatomically compatible and dynamically-functional plastic boots for racers and all skiers. The caveat was that he had to both retain the most favored dynamic qualities and “malleable feel of leather boots” and progress beyond Lange’s pioneering plastic boot success. Sven’s was an ominous responsibility and an even bigger challenge. Before designing Nordica’s first plastic boot model, Sven proposed creating Nordica’s final mass market leather boot by consulting with US Team racers. In doing so he developed numerous custom leather and plastic-laminated leather prototypes based on suggestions from each racer. Sven cataloged and tested a lengthy and complex set of design criterion to create the “Sapporo”, a hybrid model featuring the first high-back “spoiler” design. Francisco “Paquito” Ochoa from Spain won the slalom at the 1972 Sapporo Olympics wearing that Sapporo model. Sven then used everything he had learned with the Sapporo to design Nordica’s first plastic boot, the very successful “Olympic” model. It featured the first ever integrated high back inner-boot and shell spoiler as well as a removable leather-lined inner-boot with its own power-strap. As a testament to his success, most of the criterion Sven engineered for the Olympic remain to this day as the foundational design for the best ski boots on the market. Sven had a hand in designing every Nordica model into the mid-1970s, including the wildly popular Banana Boot, which got it’s name by its bright yellow shell. Then with the Grand Prix model, Sven and Nordica introduced the “floating cuff” without side ankle-hinges, a dominant feature of all Nordicas into the early 1980s. The Grand Prix (1972) and the GT (1973) models were favorites on the World Cup circuit for 30 years! By the mid-1970s, the company had a commanding share of the ski boot market worldwide. Part of the secret to Nordica’s success was Sven’s enthusiasm for testing and refining every boot model beginning with prototypes. Sven spent every winter testing upcoming models and then continued every spring and summer on Europe’s glaciers. That allowed adjustments up to the very last minute before production began. He would also ‘match-test’ them against the competition’s select models by fitting a Nordica on one foot and a competitor’s model on the other. Those tests gave him first hand proof of how Nordica fared against other major boot models. He rarely saw other factory testers on snow. Sven Coomer with a 2013 Atomic Redster, a descendent of the 1974 Nordica Grand Prix that he designed. 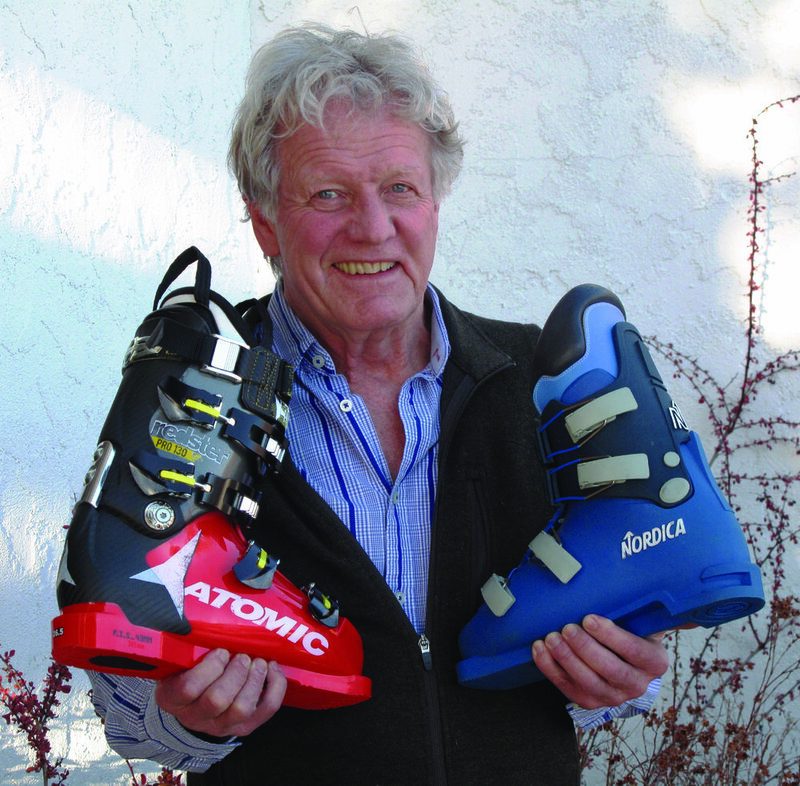 Sven left Nordica in 1978 and opened Footloose Sports Shop in Mammoth Lakes, Calif. First, to complete development of Superfeet orthoses, which he began in the early 1970s, and also to perfect the hydraulic ski boot fitting and shell expanding systems that became the rage in the early 1980s. Sven’s intent was to make customizing ski boots cost-effective at the retail level. He traveled the world presenting his new methodology in boot fitting and sales. You could say he trained the ski industry’s entire first generation of professional boot fitters. 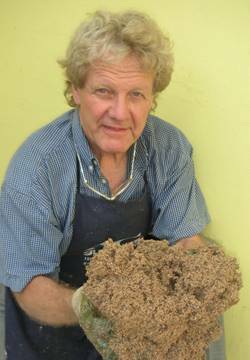 Then while consulting for Koflach, Sven perfected the foam ‘bladder’ and foam injection system, helping the longtime boot maker modernize its designs and revive its fortunes. In turn Kolfach helped Sven by introducing Superfeet with their Koflach sales force throughout Europe and around the world. However Sven — ever the perfectionist — quickly realized foam injection was fraught with unresolvable problems. It was a hit-or- miss, one-time customizing system that involved volatile chemicals. He continued to pursue something better by patenting a unique non-toxic silicone and mechanical injection system. While consulting for San Marco-Munari with former Nordica colleague and plastics engineer Enzo Prandina, they applied Sven’s silicone system and designed two functionally unique boot models, the MR-3 rear-entry and the MT-11 front-entry. They were so successful that Head promptly bought the rights and San Marco-Munari’s newly built factory, returning to the ski boot business after a 15-year absence. It was in the late 1980s when Sven formed Zipfit, featuring his patented silicone injected inner boot and orthotic system. It was a truly unique after-market product. By the mid-1990s, he developed a fill that uses the organic and living fiber of granulated cork called OneMinuteFit© and fine-tuned it with a proprietary heat sensitive binder that creates an active heat-exchange quality that is essential for skiing with comfort and control. Says Sven: "That is one reason why Zipfits constantly adjust to your feet and lower legs, ensuring the best skiing experience." The OneMinuteFit© system is pre-packed into each new pair of Zipfits, so there is no mixing or injecting for the initial fitting. Sven also developed the Spotfit© system that allows skiers to adjust the amount of fill in their Zipfits to suit their feet. Sven is now in his mid-70s and continues to improve the comfort and support of Zipfit inner boots for each season. Some skiers remark that it was already comfortable and supportive when they tried them on at the shop, but once they hit the slopes their new Zipfits become truly their own. They become more comfortable with use, and the heel-holding never falters. Like fine gloves, Zipfits just become more and more personalized. The question is not “if” you should upgrade, it is “when?” Why waste another day in liners that don’t really fit or perform the way you deserve. Start today with Zipfit inner boots. Please join Sven Coomer in the search for the best possible skiing experience by trying a pair of Zipfits. Click here for list of ZipFit dealers at ski areas and urban centers around the world. Sven and his proprietary cork composite fill. When your boots fit the way they are supposed to fit, you have better balance and control of your skis. Zipfit Inner Boots adjust continually to your feet as you ski. It's what makes Zipfit different than all our competitors. In the early days at Zipfit® , we have played a vital role in creating and then improving foam and silicone injection systems for ski boot liners. But I was never truly satisfied in terms of performance, longevity and comfort. For one, foam and silicone are one-time "hit or miss" applications. Even worse, foam requires the use of volatile chemicals. Finally, the problem with heat-molded custom foam liners is that they “pack out” quickly and offer only limited opportunity to make adjustments. So I developed Zipfit Inner Boots using my patented OneMinuteFit© cork composite fill. OneMinuteFit© (OMFit) is what we call our proprietary orthotic dynamic-response molding cork composite. That’s why my customers get 600 or more days of skiing days out of a single pair of Zipfits. Cork uses your body’s warmth and your foot’s anatomy to dynamically mold to your feet and lower leg to provide optimum comfort and stability. Cork has proven time and again to be more malleable, responsive, resilient, durable and safer than foam and silicone. Cork doesn’t pack out. I have designed Zipfits to liberate your feet and toes from boots that are too tight, too loose or just plain uncomfortable — you can make them work in any shell. Zipfit inner boots provide great insulation as well. The OMFit© cork composite compound molds to the specific morphology of your feet, ankles and legs as you ski and according to the way you ski. The result is a customized, biomechanically sound and totally functional experience. Another feature that makes Zipfit different is that you can adjust the amount of cork in your liners at anytime and as often as you need in order to achieve the perfect fit. You can add or remove the OMFit© cork compound using our SpotFit© system to ensure the best fit and complete satisfaction. If your Zipfit Inner Boot doesn't feel right then you can just heat up the shell and refit it anytime. Our Italian manufactured custom ski boot liners are available around the world. Zipfit is the hot talk among the pros, their coaches and many, many avid skiers. In the same time that it has taken you to read this page you could be out on the slopes happily—and for years to come—in a pair of Zipfits.